Yesterday, Guardians of the Galaxy Vol. 2 director James Gunn revealed that star Chris Pratt had wrapped in a live Facebook video, where he also confirmed that they will be heading to San Diego Comic Con next month. Just a short while later, the director then confirmed that principal photography as a whole has wrapped on this sequel, marking the end of a four-month shoot. Chris Pratt also celebrated the occasion through social media, where he released two new photos from the set. After announcing that production has wrapped, James Gunn went on to clarify on Twitter that he has already planned "very minimal" reshoots to "putty up the cracks," but they won't be terribly extensive. He also added that he's been working to make sure the female characters in this sequel will be represented in the toys. 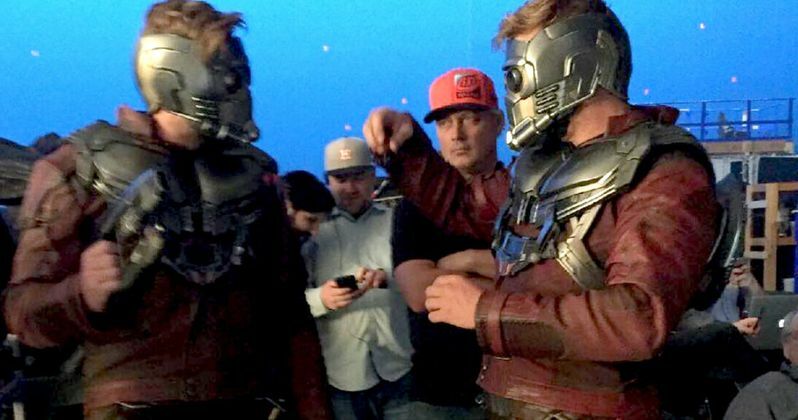 On Instagram, Chris Pratt celebrated the production wrap by sharing two photos of the actor alongside his stunt double. Here's what he had to say below. "Here's me and my stunt-man Tony McFarr (also Tommy Harper stunt coordinator and our first AD Lars Winther) on set. Been working with Tony since Jurassic World. Love you buddy! Happy wrap!" Marvel hasn't released an official synopsis for Guardians of the Galaxy 2 quite yet, but there have been plenty of rumors swirling around. Last month, an unconfirmed report revealed that the primary antagonist will actually be a female villain named Ayesha, who has also gone by Kismet, Paragon and Her in the Marvel Comics. This report claimed that new cast member Elizabeth Debicki is portraying this character, but it has never been confirmed who she is playing. Other new cast members include Kurt Russell, who has been rumored to be playing Star-Lord's dad, Pom Klementieff as Mantis, Chris Sullivan and Tommy Flanagan. Chris Pratt (Star-Lord), Vin Diesel (Groot), Zoe Saldana (Gamora), Dave Bautista (Drax the Destroyer) and Bradley Cooper (Rocket Raccoon) return as the Guardians, with Karen Gillan (Nebula), Glenn Close (Nova Prime), Michael Rooker (Yondu) and Sean Gunn (Kraglin) also reprising their roles. Take a look at the tweets and photos from James Gunn and Chris Pratt as Guardians of the Galaxy 2 wraps production.